For those of you who were wondering what its like to swim in the morning, this is what its like. Aquarena is a fantastic place to swim. 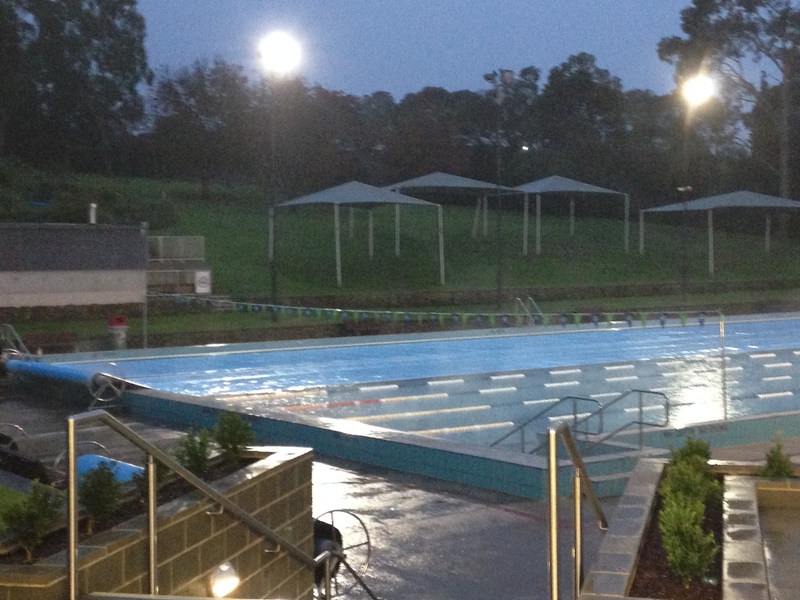 Its a 50m outdoor pool which is heated to around 25 degrees celsius, thanks to the blankets which trap the heat in overnight (several still to be removed in the photo). If you are ever in the Doncaster/Templestowe area drop by and test it out for yourself. If you are not a fan of swimming outside, there is an indoor 25m pool as well which is heated to a ridiculous 31 degrees celsius. I currently have a back strain so this mornings 5km set didn’t do me any favours. Went OK in the warm-up but when we moved into the main set which involved 200m, 150m, 100m and 50m times five on a descending time cycle, I started to have trouble breathing. Hopefully the strain fixes itself soon as the anti-inflammatory medication I got from the doctor is not getting the job down. Back in the Bay tomorrow morning for a 1 hour swim. Hoping the cold water actually helps the back.